Simple & Efficient Designs that are Inexpensive & Great Fun! In Production Since 1995. 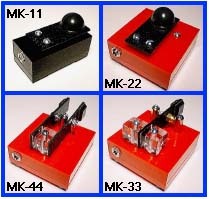 Unique Miniature Morse Code Telegraph Key and CW Paddle Products! ULTRA portable, lightweight, and efficient design is ideal for QRP and portable CW operating! Weighs only one ounce. Amazing! That's about as lightweight as it gets for keys. When you're hiking, every ounce counts! Black ABS plastic arm and 3/4 Inch diameter black rubber knob. Base: Black plastic box, 2 x 1 x 0.7 inches. 4 flat, low profile rubber feet on the bottom of the box. Contact: Button switch mounted on a small PCB within box. Has a "good feel." A super little key that is easy and fun to use! Size: 2.0 X 2.0 X 1.6 Inches. Weighs only 1.1 ounces. Wow! That's much lighter than any other competitor key we know about. Every single ounce counts when you're traveling! Plug & Play operation: 3.5 mm jack for an easy & secure connection to your rig. Base: Red plastic box, 2 x 2 x 0.7 inches. 4 rubber feet on the bottom of the box. A great little key that is easy and fun to use! Weighs only 1.3 ounces. Remarkable! Travel light with Whiterook! Plug & Play Design: 3.5 mm stereo jack for an easy, convenient, and secure connection to your rig. Nothing to hook up. Contacts: Two metal posts with a screw head and cap nut in the center of the paddle. Simple, yet has a good "feel". 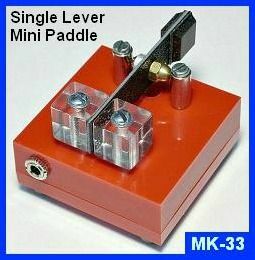 A nice, simple, low cost single lever keyer paddle that is easy and very fun to use! Weighs only 1.2 ounces. Incredible! If you hike, you know how important weight can be. Travel light with Whiterook! Contacts: Metal center ground post with a stainless steel panhead (flat) screw on each paddle. It's simple, yet has a good "feel". A nice, basic, low cost, highly portable iambic paddle that is easy and fun to use! Accessories for your Whiterook Mini Keys! 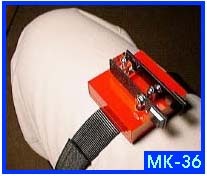 MK-36 Mini Key Leg Mount : Attention Portable Ops! We offer ready made detachable cables for our keys and paddles! Separate detachable cables are a major advantage that our Mini Paddles and Mini Telegraph Keys offer compared to others on the market. 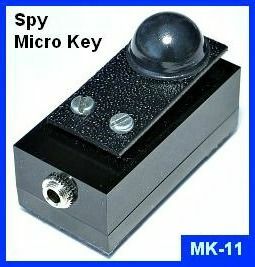 The MK-11, MK-22, MK-32, MK-33, MK-44, MK-48, and MK-49 are plug & play ready, and are free of the awkwardness of fixed length cables permanently soldered and connected, as is the case with other mini key makers. This makes our keys more flexible and easier to store and transport. Of course, you can also make your own cables. See our Keyer Paddle Wiring Diagram webpage for information on making your own cables for our Whiterook miniature telegraph keys and paddles. Looking for a Great Clock for your Shack? We got 'em! 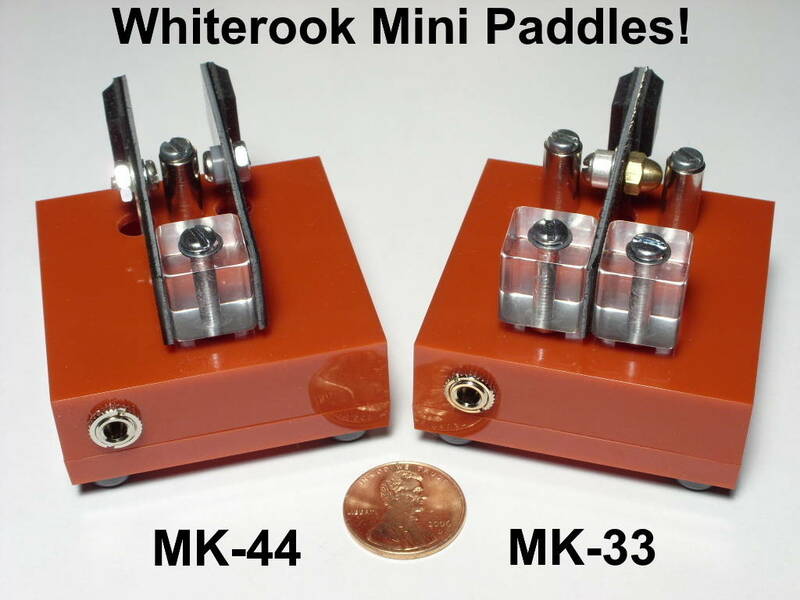 MK-42 & MK-43 Paddle Switches : Easily switch keyer paddles! 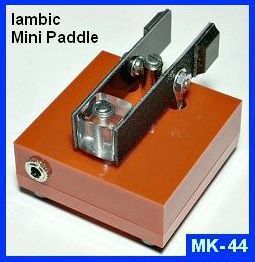 MK-64 Iambic Mini Keyer : TiCK Iambic Mini-Paddle Keyer - Our Most Popular Keyer. 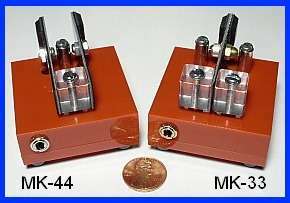 MK-60 Pocket CW Keyer : Works with ANY paddle! 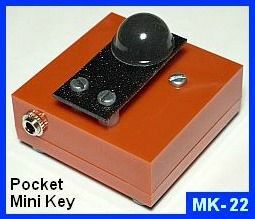 A tiny, fully assembled 2 x 2 inch Mini-Keyer. Small Plastic Boxes : Attention Homebrewers! Our pocket mini boxes are great electronic enclosures for small projects!